ExoLens®, accessory brand dedicated to elevating the mobile photography category, today announces the availability and shipping of ExoLens with Optics by ZEISS. Together, ExoLens and ZEISS have developed the first aspherical lenses for mobile photographers that will forever raise the standard of mobile photography and videography. The series of three high-performance lenses (wide-angle, telephoto and macro) is a new breed of mobile photography optics that will allow the massive community of iPhone photographers and videographers to tell a deeper story with gold-standard gear. The wide-angle and telephoto lenses bring the same aspherical lens technology that has been previously reserved for high-end DSLR cameras, straight to your iPhone as a compact mobile accessory lens. All of the lenses also incorporate the proven T*® antireflective coating from ZEISS, which minimizes reflections at the glass-to-air surfaces and improves the transmission of light. The ExoLens bracket, which connects the ZEISS lens to your phone for a truly portable professional setup, is made from precision-machined aluminum and includes soft interior liners to ensure a perfect fit and protection from scratches. The substantial and secure bracket also features an integrated standard tripod mount (1/4”-20) and cold shoe mount, allowing for compatibility with additional accessories such as microphones and exterior video lights. Leading the collection is the new ExoLens with Optics by ZEISS Mutar 0.6x Asph T* Wide-Angle lens. The lens is virtually distortion free thanks to its aspherical design, has exceptional edge-to-edge contrast and a picture quality unmatched by any other iPhone lens in the world. The wide-angle lens (18-mm equivalent) is ideal for landscape, architecture as well as creative shots with unusual perspectives. It’s also ideal for the many videographers now filming professional-quality 4K videos on their iPhone, who want a wider shot than their narrow iPhone camera currently offers. 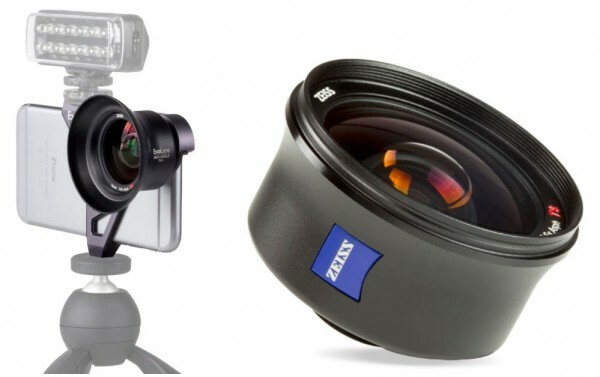 The ExoLens with Optics by ZEISS Mutar 0.6x Asph T* Wide-Angle lens and the Telephoto Mutar 2.0x Asph T* (56-mm equivalent) lens both use an afocal optical design, which is different than traditional interchangeable lenses for system cameras. This means the lenses have infinite focal length, i.e. the focus is set at infinity. This enables photography of objects from infinity to the close-up range, the limits of which are defined only by the technical properties of the mobile phone camera. Protection against dust and water spray makes the wide-angle and telephoto lenses perfect for the challenges of outdoor use. Meanwhile, the macro lens is the first and only mobile lens to offer a continuous focus adjustment function giving a 40-80-mm equivalent to allow users to fill the frame with subjects with diameters between 1.2 to 4.7 inches. An optionally attachable and semi-transparent diffuser serves as a spacer, allowing light to shine evenly on the object and enables convenient focusing. ExoLens with Optics by ZEISS wide-angle lens kits are available today for $199.95 at Apple® retail stores and Apple.com for the iPhone® 6/6s and iPhone® 6 Plus/6s Plus. 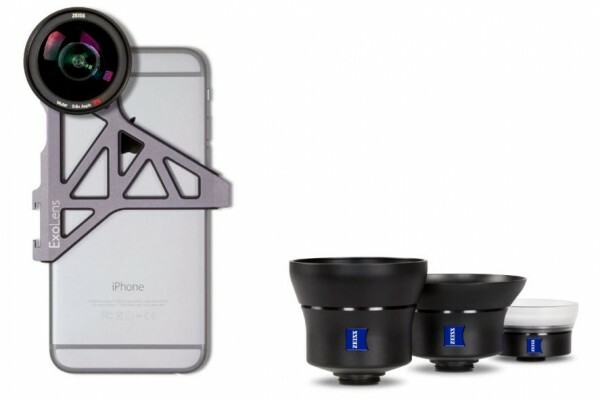 These wide-angle lens kits include the ZEISS Mutar 0.6x Asph T* Wide-Angle lens, machined aluminum ExoLens bracket, soft device-specific liners (for iPhone 6 and iPhone 6s), lens hood and caps, and microfiber carrying and lens pouches. A la carte macro and telephoto lenses will be available for purchase later this summer.